Because of our tendency to abbreviate things and make them into acronyms, those unsavory name associations keep right on coming. Many of you are using Intel products at this very moment. Intel is only one of the most significant companies of the 20th century. Founded in 1968, Intel helped to spur the personal computer industry - and unlike other chipmakers such as Motorola, Intel is still around under its original name. But bad guys have been around much longer than Intel has. And for the good guys to fight the bad guys, they need intelligence about the enemy. Since these fighters are from the U.S. federal government, "intelligence" is often shortened to "intel." You see where this is going. Specifically, it's going here. In case you're confused, ISIS has not hacked American chipmakers. Of course, this one' a double whammy, since the term "ISIS" itself more accurately refers to an Egyptian goddess - something undecidedly non-Muslim by any stretch of the term. Content blockers block content. As @danprimack notes, that means that they block content. It sounded like a really great idea at the time - whether the time was now, when iOS 9 now supports ad blockers, or perhaps when the time was before, when you added that ad blocker to your Internet Explorer web browser back in the day. Ads and other unwanted content pop up on your phone, or your laptop, or your desktop, causing you irritation. So you decide to install an ad blocker or content blocker to free yourself from the anguish. But guess what? I hope you're sitting down for this. Now perhaps I sound like Captain Obvious - and if you're actively using a content blocker, I need to explain to you that I'm referring to a hotels.com ad campaign - but any action that you take can have unintended consequences. Dan Primack of Fortune has noted that someone with an active content blocker could be on a mobile phone, intending to buy something, and then be unable to buy it, or even see it. After hearing initial reports from Chris Mason of Branding Brand, Fortune went and replicated the issues. First, it used an iPhone to go go the Bass Pro Shops mobile website, and looked at a picture of a boot, with the accompanying price. Then Fortune visited the same mobile site, but this time did so with the Crystal content blocker enabled. Guess what? No boot, and no price, was visible. You can see this example and other ones here. Fortune described a number of cases in which the content blocker blocked content. Maybe individual pictures won't load. Maybe the entire web page won't load. Or maybe the web page will load, but you can't load anything into the shopping cart. ...but at the same time, because the website doesn't know about your preferences, 60 year old men are unable to figure out why the websites that they visit serve up an endless array of Justin Bieber and Tampax news. 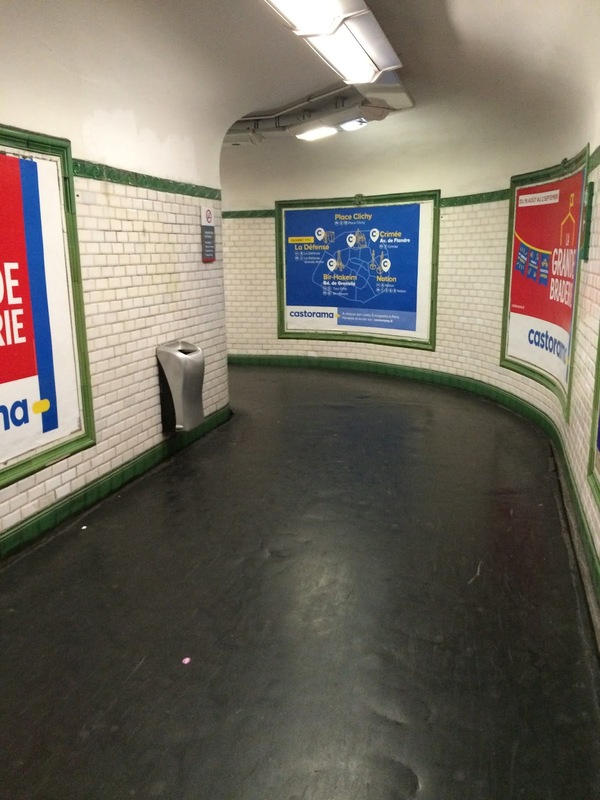 Contextual ads are imprecise enough when they do know about you; what happens when they don't? The trouble for retailers, of course, is that Crystal is just one ad-blocker. Another, Purify Blocker, currently sits at #5 in the App Store, and all of this is just one week after Apple unveiled its new operating system. Even if retailers reach out directly to one, they may be playing whack-a-mole. It won't happen, but the advertising world is imagining a worst case scenario in which people try to use their phones to shop at mobile websites, give up in frustration because the mobile websites "don't work" (when in reality it's the content blocker that is causing the problem), and then eventually decide that the smartphone is pretty much worthless and that there's no need to buy that latest insanely great smartphone after all. The more likely scenario is that people will buy the content blockers, hear about the problems they cause, turn them off, and then forget to turn them back on again. Or maybe this is just this weekend's tempest in a teapot, and a blip - or a Blippy - on the landscape. Hindsight makes us all experts, but frankly you can't fault the people in the past for not anticipating things. In March 1865, no one at Ford's Theater in Washington was agonizing about the protection of important patrons. In August 2001, no one in a tall building was worried about a passenger plane ending up in his or her office. And back in August 2015, no one was thinking that a Volkswagen diesel engine was a bad thing. The Tiggy cries out for diesel power. Well, I cry out for it. Why not? The Golf — which is kin to the Tiggy — is available with VW’s superb TDI four cylinder turbo-diesel, which returns 30 city and 42 highway in the Golf wrapper. In the heavier Tiggy, the TDI’s numbers would probably be lower. But they’d still be spectacular — probably best in class. As would the tow rating. The gas Tiggy’s 2,200 pound max is good — better than the typical 1,500 pound rating of many small crossovers (both the Kia Sportage and the Mazda CX-5 max out at 2,000 pounds). But with a high-torque diesel up front, the Tiggy could probably pull at least 3,500 pounds; maybe more. Arguably, a diesel in the Tiggy makes more sense than in the Golf. It — the Tiggy — is a crossover SUV, after all. The Golf is a car. Diesels are nice in cars. But they’re useful and in SUVs. They endow the vehicle with the capacity to do real work — and they notch up the fuel efficiency to acceptable levels, a critical thing these days. It’s going to be tough enough for cars to make Obama’s 35.5 MPG average mandatory minimum that goes into effect come 2016. It’ll be even tougher for heavier, less aerodynamically efficient crossovers and SUVs to get there. Dealers of Volkswagen vehicles in Hawaii say they are cautiously optimistic as the German-based car manufacturer addresses allegations that it installed illegal software into millions of diesel cars that was designed to manipulate the results of U.S. emissions tests. Tony Group President Stan Masamitsu, whose holdings include Tony Volkswagen, said the manufacturer has instructed his dealership to stop sales of all diesel vehicles with model years ranging from 2009 to 2015 that may have had the software installed on it. Does the Speaker of the House have to be a Member of the House? Now that John Boehner has announced his resignation, there is an uproar regarding the selection of the next Speaker of the House. Which raises the question - does the Speaker of the House actually have to be a Member of the House of Representatives? Given the current climate in the country, in which many outside the Beltway are literally rejoicing over Boehner's departure, there is always the possibility that a true outsider could gain the Speakership. But who would want to do a thing like that? After reading Trevor Carpenter's comment about Anheuser Busch's acquisition of Golden Road Brewing, I was not only reminded of Anheuser Busch's recent macro brew Super Bowl ad, but was also reminded about the company's worst advertising stumble - its efforts to rally patriotic fervor in the USA vs. Belgium World Cup match, despite the fact that Anheuser Busch is owned by the Belgian company InBev. But the advertisements work. While a few laugh at the hypocrisy, most people go ahead and buy the beer based upon the resonating message. But Anheuser Busch and its competitors have even more potent advertising campaigns at the local level - the very local level. If I were to dare to wear Google Glass into Shotwell's Bar in San Francisco, I would presumably run into some neon signs touting Budweiser and the San Francisco Giants, or Budweiser and the San Francisco 49ers. If I were a San Francisco resident, this would make me feel good, knowing that that brewer guy in Belgium - I mean St. Louis - was rooting for my teams. So I'd order a Budweiser. And another. Imagine for the moment that a man somehow grew up in San Francisco and never left the city limits for the first 31 years of his life. This man would have spent some time in bars, with these comforting messages about how his American beer company really loves his team. Then, one day, the man makes a wrong turn, boards the wrong BART, and ends up in the faraway mystical land of Oakland. Shaken up by the experience, he pops into a bar for relief and is shocked to discover neon signs touting Budweiser and the Oakland Athletics, or Budweiser and the Oakland Raiders. Heaven help the guy if he stumbled into an airport and ended up in the Dallas-Fort Worth area. Actually, according to Rodger Sherman, he'd be safe in Dallas, at least from the NFL perspective. Anheuser Busch does not sponsor the Dallas Cowboys (or the Bears, Packers, or Vikings). But they are the official sponsor for the other 28 NFL teams, and have created advertisements about 1972 (for Miami) and shoveling snow (for Buffalo). As the Buffalo ad indicates, the marketing staff began running out of ideas after a while. Indianapolis Colts: The perfect beer for horsing around with the boys in blue. There are many people - Tad Donaghe among them - who are certain that present technological advances, coupled with changes in the business environment, will result in major disruptions to the economy. Donaghe even postulates that there may not be enough work for everyone to do, and that governments will have to pay living expenses to people whether they work or not. With all due respect to Donaghe and others, while the times are indeed interesting, they are not unique. The Twitter account @in1876 recently shared a UK Post Office publication from 1879 that talked about the American telephone. Now this may be a surprise to some of my younger readers, but back in the day Post Offices were thriving operations. And they certainly were popular in 1879, when that odd invention was starting to take hold across the Atlantic. Before you laugh, take a moment to think - with an open mind - about what the Post Office was saying. In those days before child labor laws became the vogue, you had all sorts of errand boys who could carry messages, and they could do so in a reasonable time. With the "superabundance" of such people, why would anyone make the huge capital investments required to establish a telephone service? In those pre-wireless days, this required the establishment of huge cable lines going to every house, installation of devices in every house to send and receive telephone calls, and dedicated staff to route the telephone calls from one telephone to another. Wouldn't it be easier to just give a local message to an errand boy - or send a message via the Post Office? The game is still being played in various forms in public schools today in order to teach a concept called "values clarification". It occurred to me how absurd it is to teach children that it is their responsibility to decide who is going to live and die, and how at odds that is with the Christian ideal that all human life is created in God's image and therefore sacred. Many students played that particular game, but that one particular elementary school student grew up to become Steve Taylor - well, actually he was Steve Taylor as a kid also, but when he was a kid he didn't have a record contract. Taylor, who later ran into trouble in Australia when people misinterpreted "I Blew Up The Clinic Real Good," put his feelings into song. But even in the worst cases, the classroom game was just a classroom game. Now it's real. Last month I wrote about the history of passports in a post at tymshft.com, noting that one of the main purposes of a passport is to protect you when you leave your home country. We have to continue to save human lives at sea. Not everyone agrees with this. But it’s inhuman to think that if you have a passport, you get saved, and if you don’t, you drown. But there are people who say that. Back in February 2013, I wrote a post about the Shotwell's Bar controversy. If this has escaped your memory bank, this arose during the heady days of Google Glass version 1.0, when a San Francisco bar - yes, a San Francisco bar - made fun of people wearing Google Glass. As I noted in the post, this displeased Robert Scoble at the time. However, the people at Shotwell's didn't react negatively to Google Glass solely because it made people look goofy (even if they weren't having a naked conversation with themselves in the shower). There were also privacy implications. 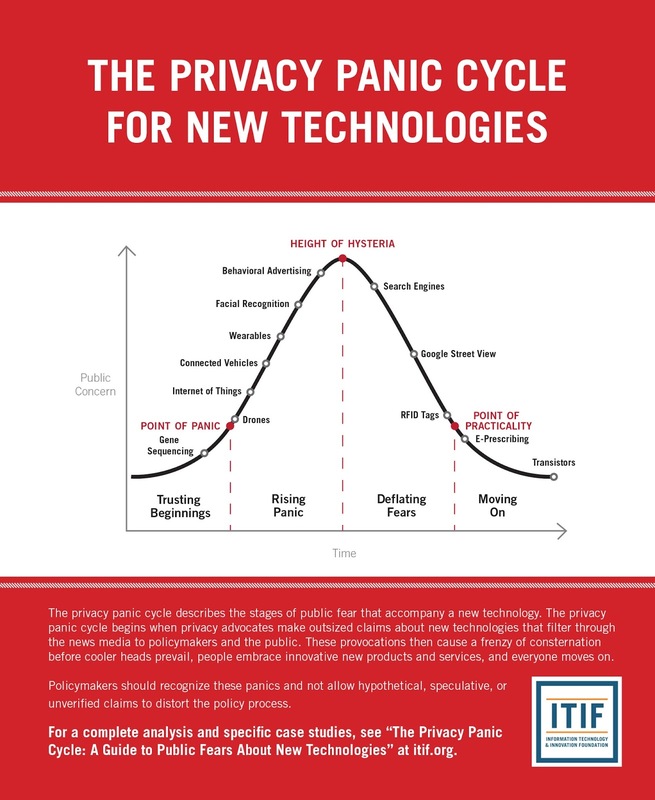 These privacy concerns are nothing new, as the Information Technology & Innovation Foundation points out. If you download the ITIF's PDF document from the link, you can read the story of a previous technology that caused panic up to the Presidential level. The paper then talks about other new technologies that were controversial back in the day, such as transistors. The ITIF's editorial view is that we have survived Kodak fiends, phonographs, and electric search lights - even if Kodak and phonographs themselves aren't as popular as they once were - and therefore we will survive mobile phones and supermarket loyalty programs and facial recognition and RFID tags. I realize, of course, that there may be opposing views. P.S. As for the 5 Point Café, its website links to its Yelp page. And if you want to see photos inside the café, just look at its Facebook feed. When I was in France, the topic of Syrian refugees was obviously a topic of discussion on the news, as it still is today. While Germany has been more than willing to take in refugees, other countries have not been so eager. Several of the countries were called out by name by Faizullah Muradi. On the surface, it can strike someone as odd. 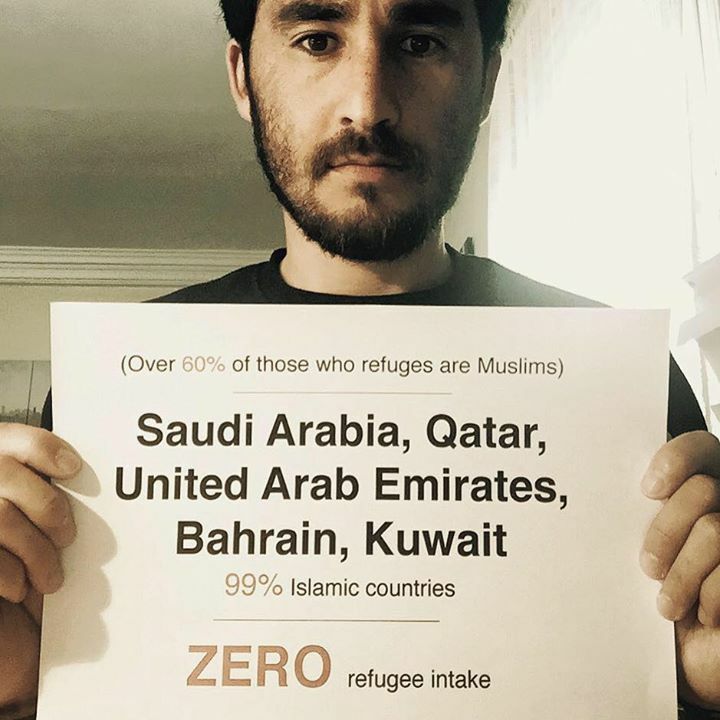 Why would Muslim countries with immense wealth refuse to take in other Muslims as refugees? I figured that there had to be a reason for this, so I dug deeper. The Gulf countries, the wealthiest states among the Arab world, are among the largest donors to Syrian refugees. But they do not take in refugees to their own countries: none of them officially recognize the legal concept of refugeehood. This is not a specific issue of hostility to Syrian refugees: the six Gulf monarchies have never signed the international conventions on refugee rights and statelessness, which began to be established after the Second World War. This is true - all of these nations, as well as many other nations such as Barbados and (interestingly) Syria, have never signed the UN Convention and Protocol Relating to the Status of Refugees. Thousands of Syrians fleeing the war have been accommodated in the Gulf, and many provided with benefits not usually available to migrant workers, like free access to healthcare and education. But they are on visitor or work visas because there is no legal category of refugeehood. And this is not just an issue of semantics, since visitor and work visas are by nature temporary, meaning that any Syrian would eventually have to leave the country. And as sports fans know, a work visa in the Gulf is not necessarily a wonderful thing. Islam requires believers to assist and protect vulnerable people and offers a number of mechanisms for their care and support. According to Islamic migration law (hijrah), individuals have the right both to seek and to be granted asylum in any Muslim state. Furthermore, it is the duty of Muslims to accept and protect refugees for as long as they seek protection. In comparison to modern refugee law, hijrah offers a broader definition of a refugee, and gives individuals, rather than states, the right to determine asylum. However, despite its significance in Islam, hijrah is rarely invoked by Muslim states today. The promotion of Islamic teachings on refugees could encourage Muslim states to widen their acceptance and protection of refugees. Unfortunately for the UNHCR, there are two problems with this argument. First, it is doubtful that the leadership of Saudi Arabia, guardians of the holy cities of Mecca and Medina, are going to let some pencil-pushing bureaucrat in New York or Geneva tell them what the truth is in Islam. Second, we can't really cast stones at Muslims for not taking care of their own, when the inhabitants of many Christian nations are unwilling to do anything either. We cannot help everybody through the world. Europe should help. Russian should help. China, they're not doing anything. The Gulf states are doing nothing. Saudi Arabia, Qatar, any of the gulf states, they're doing nothing. They should all help. And then maybe we could do something. Have you ever had to brief a Chief Executive Officer, or some high official? If you have, you know that your briefing has to be succinct, since the CEO is concerned with all sorts of stuff. Let's go one better - have you ever had to interrupt a Chief Executive Officer during some other event to convey a very important message? At that point, you have to use extra care. Which brings us to an elementary school in Florida at the beginning of the school year in 2001. It's a big event - the President is visiting a classroom. And since this is the Education President, this photo-op is a very important one. Both the school and the White House want this to go off without a hitch. The kids are going to read, and the President is going to observe. Meanwhile, White House Chief of Staff Andrew Card has a little problem. You see, before the kids started reading to the President, the White House party had heard about a plane crash at the World Trade Center - a tragic accident, or so it seemed. But after Bush went into the classroom, Card learned that a second plane had hit the World Trade Center. And believe it or not, my first thought was UBL, Osama Bin Laden. And I knew that I had to tell the president. You know, that is one of the difficult tasks that a chief of staff has - does the president need to know? This one was easy to answer. Yes the president needed to know. But how? The kids were in the middle of their reading drill, and regardless of what was going on, a Chief of Staff can't just pull the President out of the room. Card decided what he would do. ...I made the decision to send in two facts and make one relatively obvious editorial comment. And I wanted to do nothing to invite a question or start a dialogue. Now if Bush had been sitting in the Oval Office and Card was down the hall, Card could have just presented the facts and let the President editorialize to his heart's content. But due to the particular situation, that wouldn't work in this case. I opened the door to the classroom. And I walked up to the president and leaned over and whispered onto his right ear. "A second plane hit the second tower. America is under attack." Card then left the President. Under the circumstances, Card couldn't exactly unfurl a banner saying "Mission Accomplished," but he could have. Teacher Kay Daniels was sitting next to Bush and knew something was amiss when Card came out of the adjoining classroom and approached the president. Everything about the day was so choreographed, and that wasn't supposed to happen. Even the second graders sensed something. One kid described his face as (like) he had to use the bathroom. But there was another element that was present - some people in the back of the room. While the students and the teacher didn't know what was going on, the people in the back of the room did. 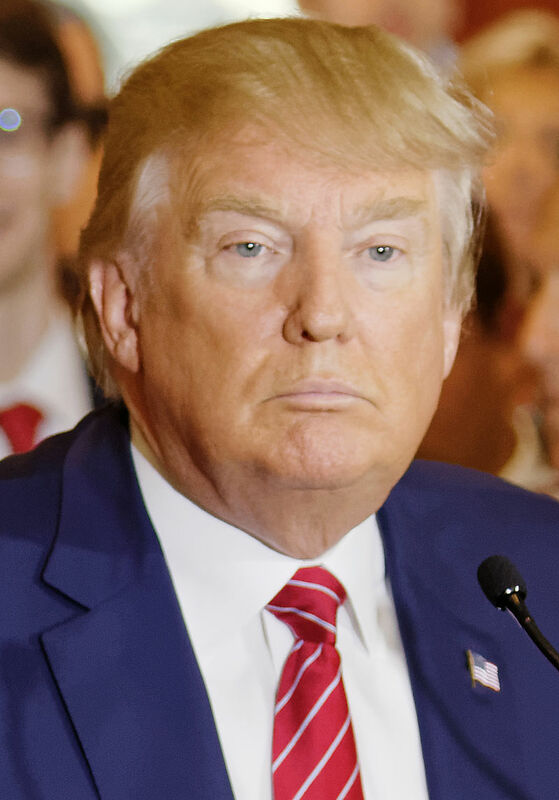 "At the back of the room, reporters were on their cell phones. They were getting the same message I got, which meant a lot of people would be watching my reaction to this crisis," [President Bush] said. "So I made a decision not to jump up immediately and leave the classroom. I didn't want to rattle the kids. I wanted to project a sense of calm." So the kids read, Bush listened, and the nation watched. Eventually the reading ended, the photo op was done, and Bush left the classroom and barked an order. "Get the FBI director on the phone." Card knew that he'd ask that. Now it is extremely unlikely that I will ever have to convey such a message to a Chief Executive Officer. But the dramatic episode does remind you that economy and precision of words are of the utmost importance. 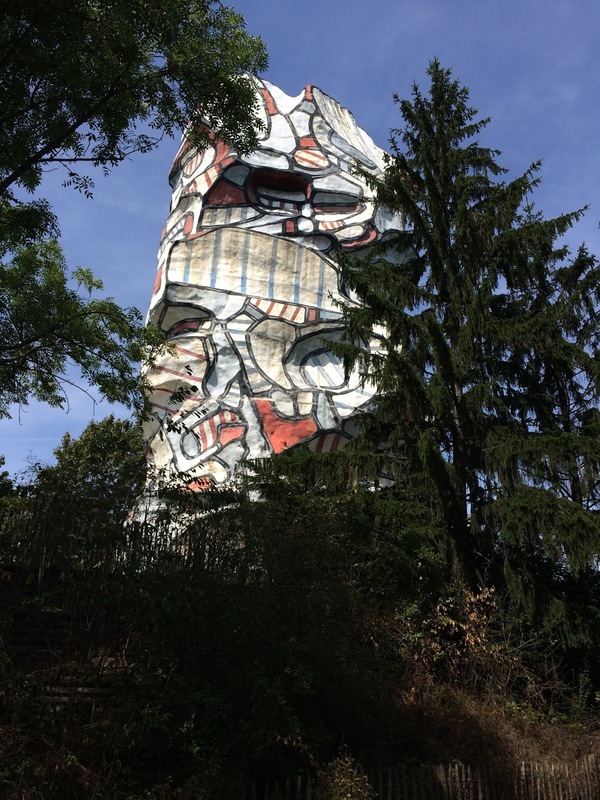 Since I had already made a trip to the Eiffel Tower area on Saturday, I had to figure out what to do with my first Sunday in Paris. 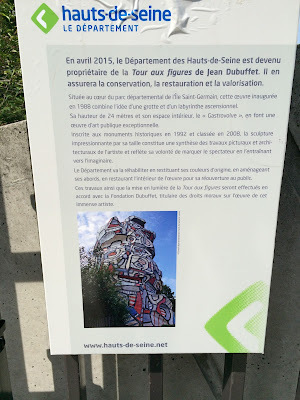 In the end, I decided to take it relatively easy and stay in the Issy-les-Moulineaux area. On my previous trip in January, I had stayed closer to the Porte de Versailles. On this trip, I was staying near the Issy Val de Seine train station, and I took a bit of time to explore that area of town. 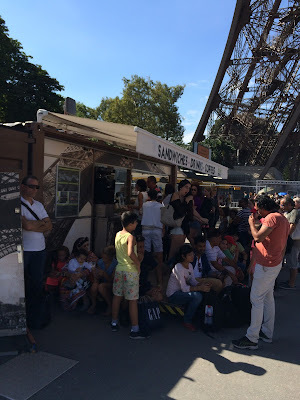 The train station is very close to the Seine River, and there is an island in the river that is within walking distance - the Île Saint-Germain. When you leave the apartments and railroad tracks and cross the bridge to the island, you are transported to a different world. 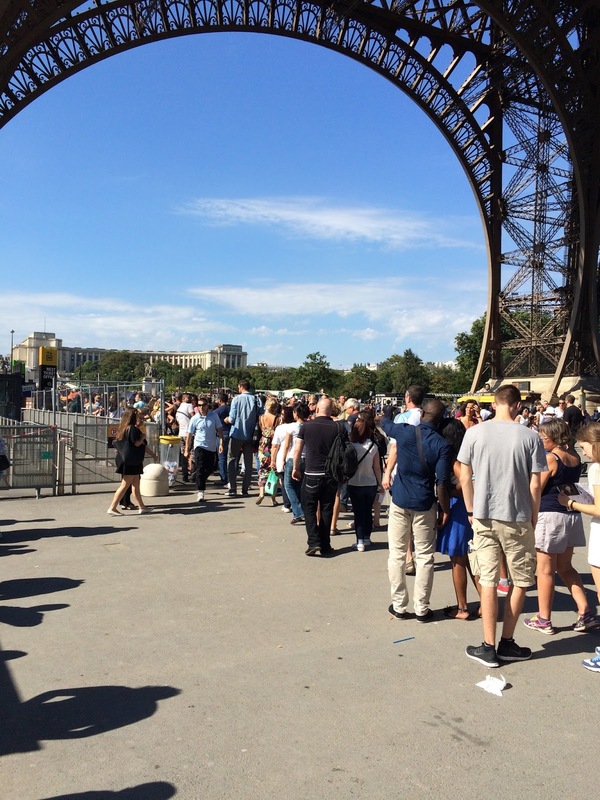 Sunday was just as hot as Saturday, and there were many people on the island who were enjoying the day, just as there were on the Champ de Mars on the previous day. But as I walked past the picnic people (or whatever you call them in French), I kept on heading toward the ominous tower that could be seen from portions of the island. For people visiting the island, a sign describing the tower had been helpfully placed nearby. This didn't do me much good, but I was able to pick out the basics. 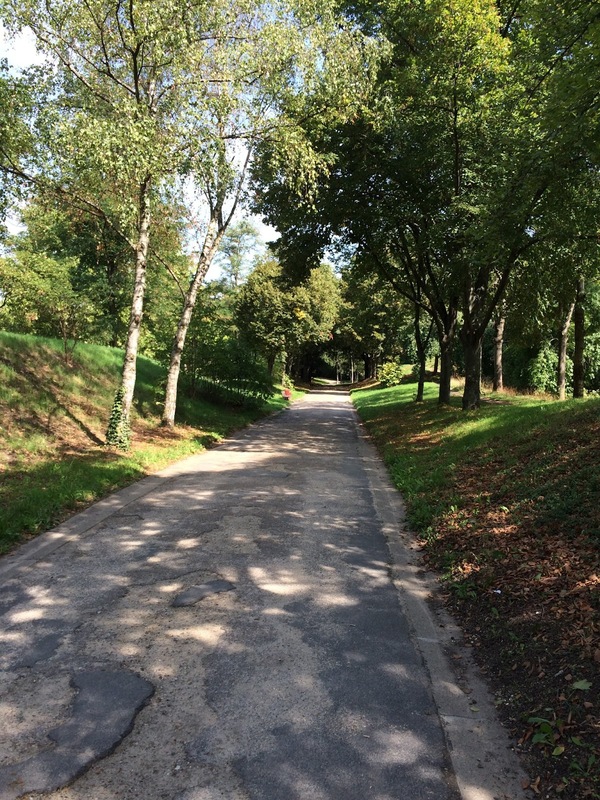 I guess I neglected to mention (again) that I was in France last week. This was my fourth trip to France. The first was a personal visit in 2000 (this is when I saw the auto museum in Mulhouse). The second, third, and fourth trips to France were all work-related: a 2010 trip to Osny (including encounters with a hippopotamus and a hippodrome), and a trip earlier this year (during which I dined on a French delicacy). That third trip was the first time that I was staying near Paris, and before I went, I was thinking about seeing some of the sights. However, by the time that I actually flew to Paris, the whole Charlie Hebdo event had transpired, and the Sunday that I had originally planned to go to Paris turned out to be the day of the massive rallies in the city. I probably would have been fine, but I figured that I'd play it safe and watch the proceedings from my hotel TV. As this trip (my fourth) approached, I figured that I'd try to see the sights again. Yes, a major incident occurred right before my departure, but in this case, the whole thing was resolved without loss of life. So I planned to go into the city on Sunday and walk around the Eiffel Tower area. But then, a couple of hours after arriving in Paris on a hot Saturday afternoon, I figured, why not do it that day? So I bought a 10-pack of t tickets, boarded the tram (I had already figured out the tram on my last trip), which took me to the Porte de Versailles Metro stop. After a bit of confusion (I thought the turnstiles would automatically open), I successfully took the Metro to the Eiffel Tower area. On a very hot day. With my late arrival, and with the lines that were already present, I figured that there was no point in trying to actually go up the Eiffel Tower that day, so I walked around the area a little bit. Rather than buying a souvenir or anything like that, I figured I'd just get myself a liter of water. That's probably the most valuable purchase that I made on my trip. 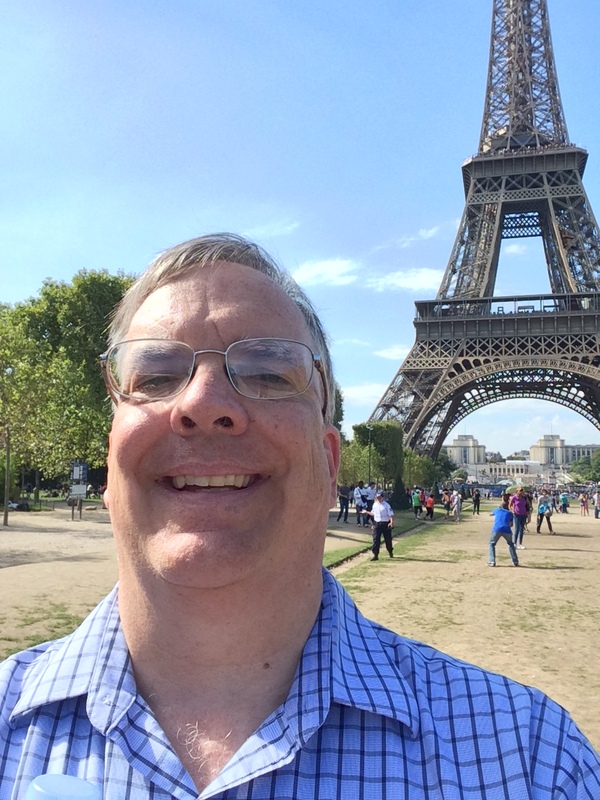 As I walked away from the Eiffel Tower, down the Champ de Mars toward the École Militaire, I had to take a selfie. But that's not my favorite picture from my trip.